September 15th (Saturday) was still broiling day though it was already in fall. 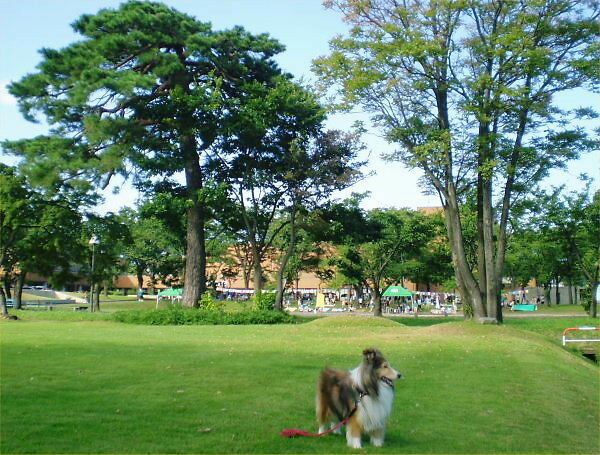 When walking with Erie in that early morning, Yoshy took a picture of this scene taken from the west of LL Shihoya Arai School toward Culture Hall. You can see the preparation for starting the joint athletic meet of three nursery schools: #1, 2 and 3 one, can’t you? Yoshy went there to see it again. Yoshy saw around only fifty children in total there. Hum… It is really falling birthrate. 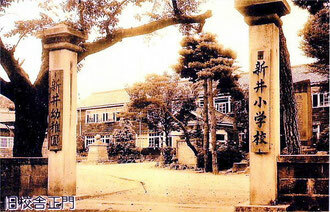 Yoshy found an old picture of the gate of ex-Arai Elementary School in around 1960. The place of this old picture is exactly where Erie is. Yoshy feels like hearing the busy sound or voices of the 1,200 children at the times.